Homelessness can happen to anyone, anytime. Sometimes it’s a result of circumstances, such job loss, eviction, divorce, domestic violence, mental illness, or high out-of-pocket medical bills. Sometimes it’s a result of one’s own choices—most often, substance abuse. It’s impossible to say exactly how many homeless people are in the Phoenix area. Maricopa Association of Government’s 2018 Point in Time (PIT) homeless count identified 6,298 people experiencing homelessness in the region on the night of Jan. 22, 2018, a 12 percent increase from the region’s 2017 number of 5,605. The most recent count was conducted in January of this year, but those figures won’t be available until summer. While the overall numbers went up, the 2018 count also showed that the number of homeless individuals, youth, and families who were not in shelter continues to increase. The PIT count showed the number of people living in unsheltered situations was 2,618, a 27 percent increase from the previous year’s number of 2,059, and a 149 percent increase from the unsheltered number recorded in 2014. Regionally, the number of people living on the streets has more than doubled since 2014, with an average increase of about 24 percent each year. The results from the count help us to better understand the widespread nature of homelessness, identify trends, and help target critical funding and services to those most in need,” said Sen. Greg Stanton, a former Phoenix mayor. According to the Phoenix Rescue Mission, 37 percent of Maricopa County’s homeless people are families, usually a single mom with kids. The Phoenix area ranks 15th highest in the U.S. for the number of homeless people in families. The team manning the Circle the City mobile medical unit to treat homeless patients in the Sunnyslope area includes, from left: Lilia Gonzalez, medical coordinator; Marten Humphrey, R.N. ; and Bobby Rhudy, N.P. (photo by Teri Carnicelli). These annual figures are particularly important in helping state, city and local agencies better understand the nature of homelessness, identify trends, and capture funding for critical services to combat the widespread issue. In Phoenix, one partnership that continues to grow in its efforts to serve the homeless is a collaboration among three nonprofits: HonorHealth, St. Joseph the Worker, and Circle the City. HonorHealth is a nonprofit, local community health care system serving an area of 1.8 million people in the greater Phoenix area. It operates John C. Lincoln Medical Center and the Desert Mission Food Bank, both located in Sunnyslope. The Desert Mission Food Bank offers emergency food boxes, nutrition education, gardening classes, and other free and reduced-cost food programs for its homeless and low-income clients. About four years ago, St. Joseph the Worker started sending its Mobile Success Unit, Arizona’s first-ever mobile job development office, to the Desert Mission campus to service the clients of the food bank. St. Joseph the Worker’s mission is to assist homeless, low-income, and other disadvantaged individuals in their efforts to find long-term employment. In 2017, St. Joseph the Worker found permanent office space inside the Desert Mission, 9229 N. 4th St., now operating Monday through Friday. Last August, St. Joseph the Worker received a $120,000 grant from the Nina Mason Pulliam Charitable Trust in support of its Employment Heals Sunnyslope program. Services fall into three main categories: job readiness, including helping to prepare a resume, mock interviews, and how to effectively explain a large gab in employment; job search, including providing a temporary address and phone number to use for messages, internet access to search for a job, basic hygiene items, and professional clothing; and employment support, such as financial assistance to pay for work uniforms, providing reduced monthly bus passes, and help with certification or license fees. For more information, visit https://www.sjwjobs.org. Circle the City is an Arizona nonprofit community health organization dedicated to providing high quality, holistic healthcare to men, women, and children facing homelessness in Maricopa County. In February, Circle the City partnered with HonorHealth’s John C. Lincoln Medical Center to address the healthcare needs of the homeless population in Sunnyslope. An estimated 25.3 percent of the population in Sunnyslope lives below the poverty threshold, including hundreds of individuals who live unsheltered on the streets. The partnership, called “Circle the City in Sunnyslope,” will embed a Circle the City homeless-specialty Health Navigator in the John C. Lincoln Emergency Department. In addition, Circle the City’s mobile medical unit, staffed with a medical provider, registered nurse, medical coordinator, and a licensed clinical social worker, parks in the hospital’s north lot at 2nd Street and Hatcher Road every Monday from 9 a.m. to 4 p.m. On Tuesdays, it travels a short distance down the street to the St. Vincent de Paul soup kitchen, where it parks for the day. 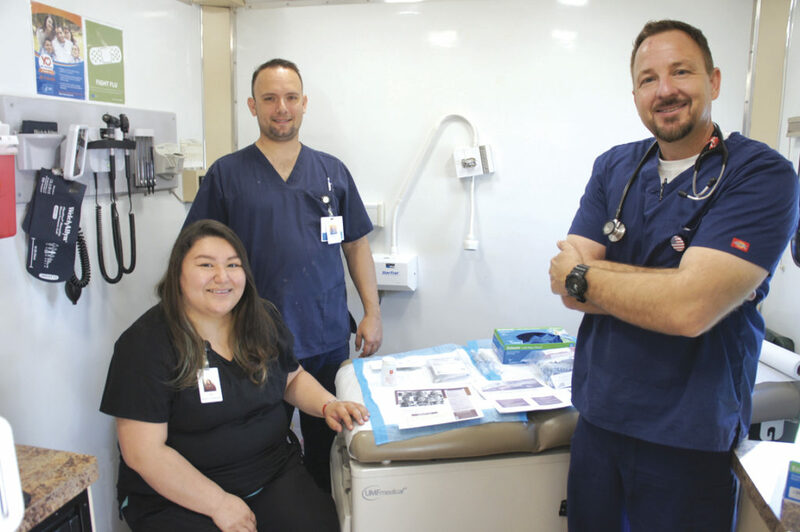 On March 5, Circle the City hosted an “open house” at the mobile medical unit, parked in the HonorHealth parking lot, for members of the larger community to come and view what is being offered, and to learn more about the program, in hopes they will help spread the word as well. Members of the Phoenix City Council, representatives from the Neighborhood Services Department, Desert Horizon Precinct Commander Steve Martos, and other local officials were in attendance. The mobile medical unit has two exam rooms with partitions that can be closed for privacy. The mobile medical team provides illness and injury treatment, chronic disease management, flu shots, and behavioral health consultations. The vehicle carries only over the counter medications on board, but prescriptions can be sent to a nearby pharmacy of the patient’s choice. The team can see an average of about 14 patients a day, but makes contact with closer to 40, says Lilia Gonzalez, medical coordinator for the mobile medical unit. Some may not be seeking treatment but are looking for adhesive bandages or other basic first-aid supplies, or might be interested in referrals for other services. Circle the City (www.circlethecity.org) is exploring other key locations, such as the Sunnyslope Family Services Center, area churches, and perhaps even the Acacia Library, to find regular stops for the remainder of the week, as word-of-mouth spreads among the homeless population and more people come to seek treatment. Currently those locations rotate just on Fridays. “With the homeless community, it takes time to build trust. But already those who we have seen are spreading the word to others in the community, and saying they will bring their friends with them next time,” Gonzalez said. If a patient comes to the mobile unit with higher medical needs, they can be referred to the adjacent hospital’s emergency room. Similarly, if a homeless patient comes into the emergency room that requires some type of primary care follow-up, he or she can be referred to the mobile medical unit for continuing care. The Circle the City homeless-specialty Health Navigator staffed inside the hospital’s emergency room will be able to help with case management, whether that involves connecting with housing opportunities, behavioral health services, social security or VA benefits assistance, and more.